With 85 boats entered the site was very busy this morning as campers woke to a misty morning after a cold night. Saturday’s racing should have started at 11am but the mist was very slow to clear and it was after 2pm before the fleet took to the water. Some eager starters caused several general recalls, so it was to be another hour before the first race got under waySunday dawned with stronger winds which continued throughout the day keeping the many rescue craft occupied standing by while capsized dinghies were righted by their helm. It was to be another long day on the water! – The fleet went out at 10, sailed three races and were back at 2. It really was a series of two halves with some competitors doing well in Saturday’s lighter winds and others favouring Sunday’s gusts. Overall there was a good mix of conditions over the weekend to test the competitors, but Felicity Foulds from Norfolk Broads Yacht Club, mastered them, was consistent, and took the championship title. 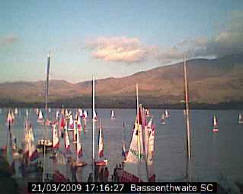 The Regatta which was thoroughly enjoyed by all.